In honour of Valentine’s Day, this month’s Biography Store display at Kensington Central Library is on the theme of Loves of the Famous. Many couples have walked on the world stage as separate individuals in their own right – but what of the more intimate stories of the relationships between them? How have the relationships between Her Majesty the Queen and Prince Philip, between Bill and Hilary Clinton or between Gilbert and George helped inform the work they do? What was the experience of the partners inhabiting the shadows behind their more famous significant others – sometimes, as in the case of Alice B. Toklas, made the subject of the other’s art? Then there are the private passions which became part of the mythology and iconography of some of the biggest Hollywood stars – Burton and Taylor, Bogart and Bacall, Hepburn and Tracy. Amongst the biographies of the famous which focus on all aspects of their private and public lives are those which concentrate on marriages, affairs and liaisons, sometimes official, sometimes clandestine, and show that the same passions and problems recur in all human love stories. Some of the most intimate records of relationships are love letters by the famous – though sometimes famous for very different things than their romantic passions (who knew Ramsay Macdonald, the first Labour Prime Minister, was such a one for sweet nothings? Henry the VIII could be pretty risqué and was not backwards in coming forwards in his letters to Anne Boleyn. Some of the love letters included are intensely private, and the writers would never have imagined they would be read by anyone other than the addressee. Some have become famous as works of literature and historical testaments in their own right, like Oscar Wilde’s “De Profundis”, his letter written to his former lover Lord Alfred Douglas from Reading Gaol, which shows that the intimate minutiae of feelings come before the retrospective resonance of socially significant moments. Some – like the correspondence between Abelard and Heloise in the 12th century – are classics of world literature, and prove that whatever the forms of expression used, human emotions are still very recognisable across the centuries. One of my favourites is one of those many books in the Biography Store Collection which give an intriguing insight into previous times – it’s Royal Love Letters, a collection from 1911. The publisher is none other than Mills and Boon, and it seems not only the content of their books but their presentation has definitely been spiced up in the last 108 years. This is a decorous volume – although maybe the deep purple binding hints at the passionate content – and the illustrations are of various royal personages looking very correct, not a steamy clinch in sight. A list of other available titles doesn’t quite set the pulse racing, and apparently Mills and Boon didn’t only produce romantic titles in the Edwardian era: “Rambles in the Black Forest” and “Nerves and the Nervous” were amongst its non-fiction offerings. We hope you enjoy our Valentine’s selection of the romances of some of our most celebrated figures. Warning! Searching the online resource the Oxford Dictionary of National Biography (ODNB) can be addictive as “all human life is here”. Most people use this dictionary to search for a specific individual. However you may not be aware that using the advanced search options and selecting other search criteria will create lists of names of the great and the good… and also, it must be said, the not so good. To use the advanced search facility, click on one of the “More Search Options” displayed beneath the main search box. Curiosity led me to check how many people there were with Kensington and Chelsea links by using these terms in the ‘place search’ category option. The result was over 3000! However this figure is misleading, as a casual check of a few entries revealed that the connection was often limited either to their unfortunate death in one of the borough’s hospitals or attendance at one of the borough’s schools. I whittled down the 1975 Kensington entries to 122 by selecting the “Law and Crime” category from the drop down list of occupations (found in the “Fields of Interest” search category). Amongst the list of lawyers and judges I found John Christie, the Notting Hill mass murderer. You may wonder why he is included. The DNB does not only include the great and the good. To quote the website “the Oxford Dictionary of National Biography is the national record of men and women who have shaped British history and culture, worldwide, from the Romans to the 21st century”. In the case of Christie, the miscarriage of justice leading to the hanging of the innocent Timothy Evans, to quote Christie’s DNB entry, “played a significant part to the subsequent abolition of the death penalty in Britain”. For further details of the case and posthumous pardon of Evans read the Ludovic Kennedy book 10 Rillington Place which can be found at Kensington Central Library, or borrow the DVD feature film version of the book, staring Richard Attenborough as John Christie. Finally it is also worth investigating the “Themes” tab to display the large number of collective biographies brought together under such topics as climbers of Everest, British monarchs, First World War poets and significant military and political leaders involved in that conflict. Other lists include a number of founder members of institutions and other significant groups. In Earls Court’s sixty years ago on the 24th of September the Routemaster bus was unveiled by London Transport. It is I am sure missed in a lot of ways by nostalgic Londoners (although I am glad I do not have to get my buggy onto it), but equally I am sure they would never be allowed these days with the dangers they pose: crazy children (and adults) leaping onto and off platforms to catch or leave the bus, who cares about whether you are at a stop or not! I managed to survive these crazy antics (I remember I preferred the Routemasters to the “new” buses as they were always quicker to where you wished to get to) and was very excited with the bringing in of the new(er) Routemaster, feeling the need to catch it for just two stops when I first saw one on our streets! They certainly will be more popular than the bendy buses with Londoners but will they be as popular as the old Routemasters? And will they survive just as long? TFL have a lot to say, telling us about the old and the new Routemaster buses… Or why not view the article an article from the time (in the Times) from the Times Digital Archive. So when did they finally go onto the streets of London? The Illustrated London News suggests it was not until July 1961. But an experimental model went all the way from Golders Green to Crystal Palace on route 2 in 1956. The Times Digital Archive, Illustrated London News, and much more, are all available in the Reference Library- come in to find out more! Chelsea Reference Library had a bit of space on the wall above our costume collection, and what better way to fill it than with some beautiful images from our fashion and costume periodicals? Classical Greece influenced dress was at the height of fashion in 1808, featuring a high empire waist line and long straight skirts. Woman dampened the muslin draperies so that they clung to their figure! This evening dress from 1812 features a great turban – indoor caps for daywear weren’t that fashionable in this era but essential for evening wear and turbans were a very popular choice. By 1928 a very different silhouette was in fashion –with so called leg-o’-mutton sleeves and skirts with tiny waists and wide bases. Check out the elaborate trimmings and hats! By the 1850’s ladies skirts were so domed that they had to be supported by hoped cages called crinolines and lots of petticoats. And then by the 1870’s the fashion was to have a flat front of the skirt, with lots of fabric pushed to the back… called a bustle. 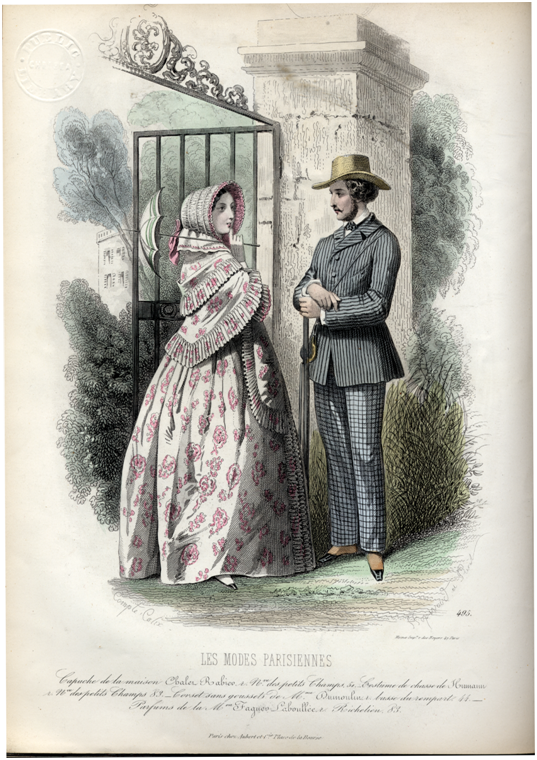 This image features a popular style called the Dolly Varden (Charles Dickens fans will get the reference) – where you have an overskirt which is shorter at the front with the sides and back bunched up. Here are a few other images that were on the shortlist but didn’t make the final cut. We hope you like our choices! Woman’s dress of woven silk with applied plated trimming, lined with linen. British, about 1805. To find out a bit about costume in this era we also read History of Women’s Costume by Marion Sichel. Come along to Chelsea Library to find lots more about the world of Costume and Fashion, or log on to Berg Online with your library card! Who’s Who is a very popular resource both locally and nationally at public libraries. It is free for library members and what sets it apart from its competitors is that each entry is provided by the biographee which essentially makes it autobiographical. It has been published annually since 1849 and is the first biographical work of its kind with approximately 1,000 entries added every year. Inclusion has always been by prominence in public life or professional achievement. Inclusion therefore carries a considerable level of prestige. Once someone is included in Who’s Who, he or she remains in it for life, so for example MPs are not removed when they leave Parliament. When someone dies, their biography is transferred to Who Was Who, where they are usually printed as they appeared in the last Who’s Who, appended with their date of death. Accessibility: Free to use and available 24/7! For a demonstration of a particular resource at Kensington Reference Library please e-mail information@rbkc.gov.uk. A member of staff will be delighted to help and set you off on your own journey of discovery. Next online resource featured will be The Oxford Dictionary of National Biography (DNB). Colin Clare, Senior Customer Services Assistant at Kensington Central Reference and Chelsea Reference Libraries is a huge cricket fan – so he didn’t need much persuading to write about Wisden Cricketers’ Alamanack. Ahem, excuse the cricket pun – over to Colin…. Some of you may be aware that England have been playing Australia at cricket this summer and doing rather well by winning the latest series of test matches again and therefore retaining the “Ashes” – so called after the England’s team were defeated for the first time on home soil. That defeat was in 1882 and this great sporting competition between England and Australia has been going strong ever since. The battle for the Ashes will continue in Australia this coming winter. However, I wanted to use this blog post to write about a cricketing milestone that has been reached this year as 2013 sees the 150th edition of the Wisden Cricketers’ Almanack. Affectionately known as the “bible of cricket” this is a book which is essentially an amalgam of cricketing topics, awards and key statistics about the game. With its distinctive yellow cover, a new edition of Wisden has been published every year since 1864 making it the world’s longest running sports annual in history. The original Wisden, founded by the Victorian cricketer John Wisden, only had 85 of the 112 pages devoted solely to cricket – the rest was padded out with other subjects unrelated to cricket such as notable dates of battles of the English Civil War and the rules of quoiting! Nowadays modern editions have over 1,500 pages. The first Wisden would have cost you a shilling to buy – the same book would now set a collector back £20,000. Fortunately, if you want to look at old editions of this book, you can, as Kensington Central Reference Library’s store has a very good collection of Wisdens going back virtually every year to 1896 (33rd edition). By George – he’s here! The birth of Prince George Alexander Louis inspired one of our Triborough Reference Librarians to take a look at our reference resources…. Gosh everyone was rather excited about the birth of Prince George recently. Not just in the lead up to his birth as well but the naming, first glimpses and photos as well. Of course Prince George isn’t the first royal baby by any means. I had an interesting time looking through our Illustrated London News for images of our current Queen, Elizabeth II at around the time of her birth in 1926. And a child that’s born on the Christmas day Is fair and wise and good and gay. I think that Christmas day refers to Sunday in this instance but it would become the Sabbath day in later versions. If you’re not sure what day of the week you were born on – you can check on the brilliant website Time and Date. I was born on a Wednesday so apparently I am full of woe! So – Prince George was born on a Monday (22 July 2013) and the newspapers are indeed saying that he is fair of face. Perhaps more traditionally we would say he looked like Winston Churchill though? If you are interested in such proverbs, folklore or previous royal births why not look up which day you were born – and thus your fate, learn about some proverbs from Oxford Reference Online (in the library or from home with a library card). Have a browse through the Illustrated London News in Kensington Central Reference Library. Delve even deeper into folklore, customs, myths, and more in the Folklore and Customs collection at Kensington Central Reference Library. If you’d like some tips on researching your family history – come along to Marylebone Library’s Family History Group. Debby Wale, one of our Triborough Reference Librarians has been looking through our reference store at Kensington Central Library and she’s found some interesting adverts. This advertisement is from Modern Publicity 1937-38. Modern Publicity was an annual publication that ran from 1930 to 1984 (it was renamed the World Advertising Review in the 1980s). It was published by The Studio group and covered posters, printed material, packaging and trade marks from around the world. These annuals belong to the reference library at Kensington Central Library – they’re certainly worth a look! ‘Oh, children, you’re surely not going out? Why, I’ve just put out the cocktails and cigarettes! Are you, like Mrs Schofield in danger of losing touch with your children? The best of parents are apt to forget that children need to be coaxed into taking their cocktails. For this purpose there is nothing to equal Greys. These specially prepared cigarettes are invaluable for preventing smoke-d. And if you don’t believe this – well, what on earth will you believe? In the immortal words of Victor Meldrew… I don’t believe it! Advertising standards certainly have improved since 1937. This amazing advert is in the volume published in 1983.